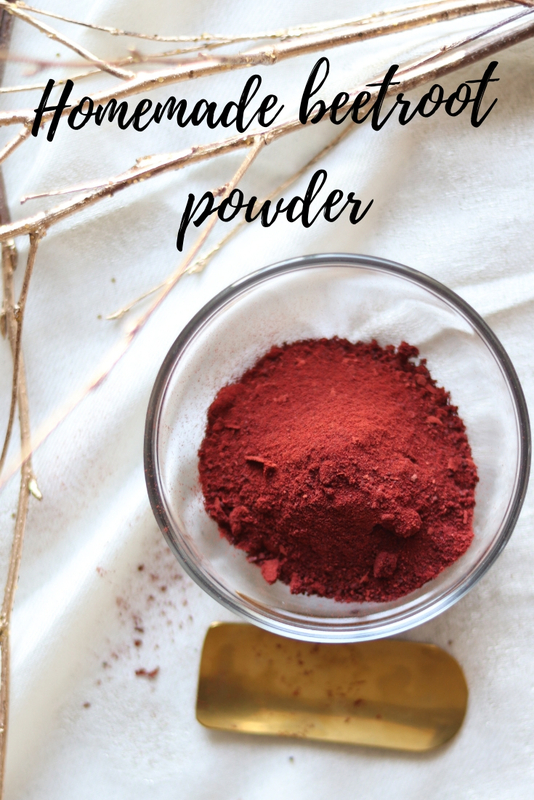 Making homemade beetroot powder is so simple, and you can be sure that it is actually just pure organic beets in powdered form ready for use, and nothing else.. no other ingredients and no preservatives . I love beetroots, and use it in so many forms, in a variety of food including paranthas, pooris , salads, soups and dips. 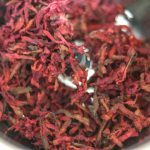 You can boil it, grate it, puree or roast it, and it lends such a vibrant colour and taste to everything it is added to. 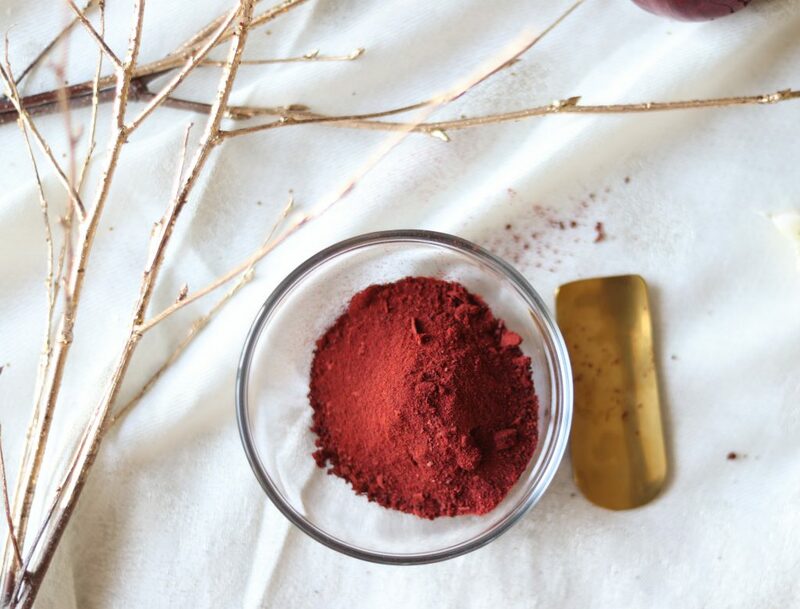 Beetroot powder is something that has been a part of superfood markets for quite some time now. It’s uses are innumerable. 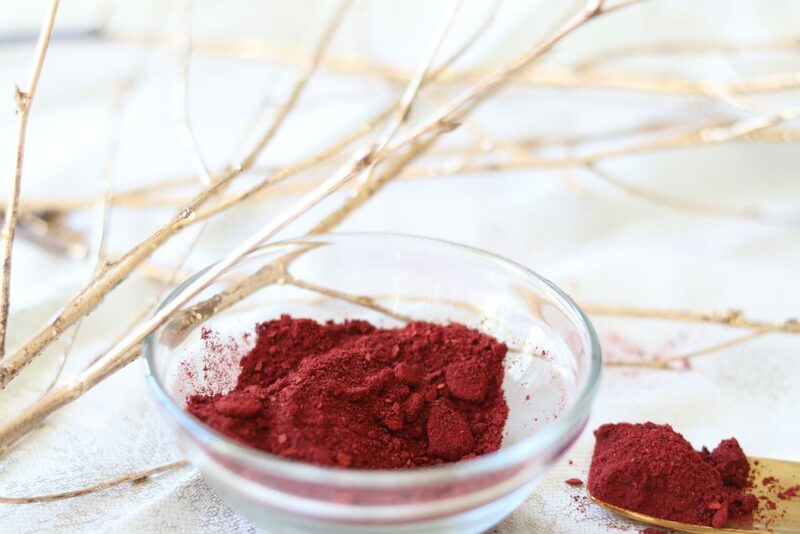 Check out this article, that details the uses and benefits of beetroot powder. It had never even occurred to me that this can be made at home, till the time I visited home this year. I found this in my mums pantry, and that too homemade using home grown beets !!! She uses it to add color to the curries, instead of using any artificial colouring agents.My… my…. this was such an enlightenment for me , hmmmm.. if thats too strong a word in this pretext, let it be like a “pleasant surprise ” . 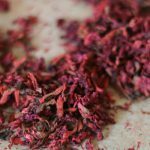 I was so happy to have found a new way to add beetroots to my recipes, having a treasure of this superfood ingredient in my hands. All smiles ! 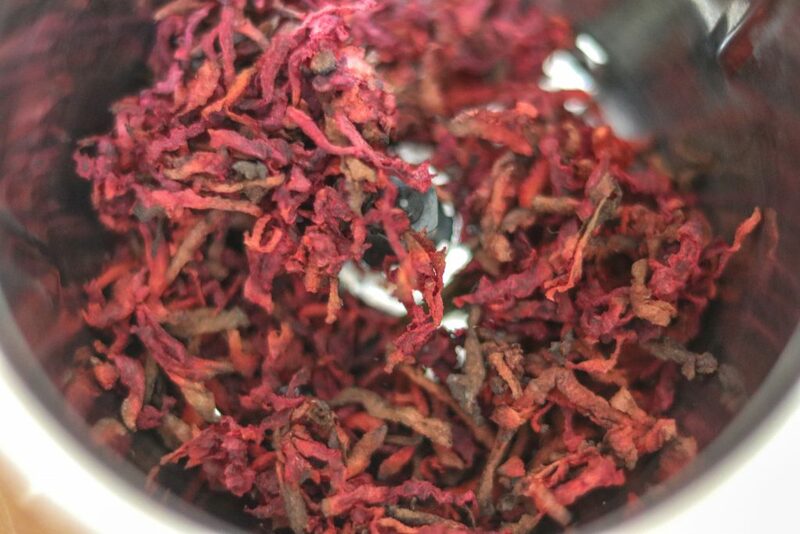 The weather of India is perfect to dehydrate not only the humans, but any type of plants or leaves (Ok ! Sorry for this bad joke). Most of the indian families use this time to make and stock up homemade kasoori methi, dried mint, kadhi pasta (curry leaves), turmeric, amchoor (dried mango powder)and other dried sipces . These ingredients, are used extensively in the Indian cuisine. Peel, wash and grate the beets. Then cover these with a clean muslin cloth, and let these dry in shade, in natural heat for 2-3 days (depending on the quantity of the beetroots). Do not keep it directly under sun, as it will lose its color. In between keep shuffling the grated beetroots , so that the complete qty is dried in uniformity. Once dried she ground it into a fine powder in a high speed mixer/ grinder. You can use a coffee grinder if you have one.Its perfect for this purpose. 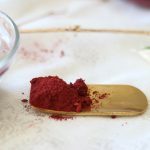 Once it is ground into a fine powder,Its ready to use.This method might take 2-3 days for the beets to dry, depending on the beetroot qty you are drying, and the temperature. 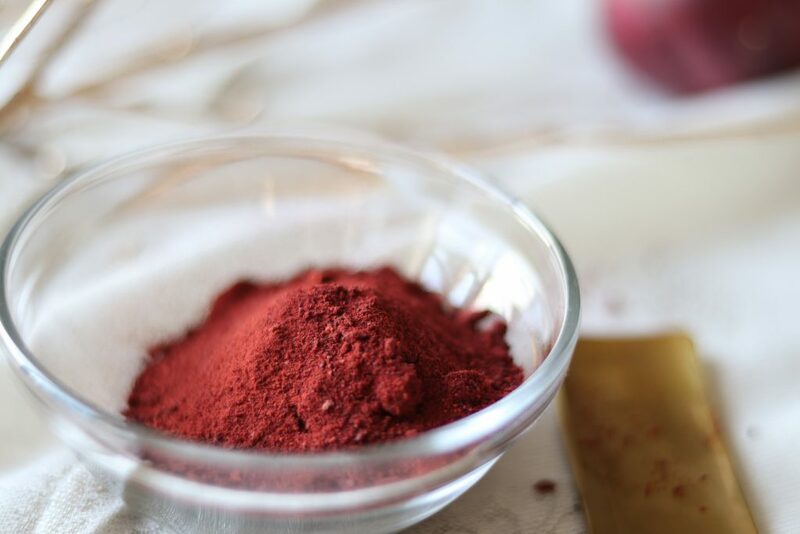 Back in UK, I wanted to make the beetroot powder at home. To make that I used organic beets, and used the traditional method , but to my disappointment the sun never shown ! Inspite of knowing that this would be the case here, and i would not be successful, i still tried . Please don’t ask me why !!! Obviously after my first attempt failed, because there was not enough warmth, and the weather was too damp, the next best alternative was to use the oven.And thats what I did. 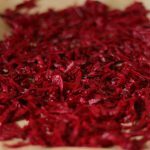 Now its so much time saving if you are drying the beets using the oven. The only thing you need to be aware of is, that you can easily over roast the beets, and these can lose the nice pink colour and can taste bitter. So please follow the temperature and timing carefully, and keep checking in between to make sure not to over roast the beets. 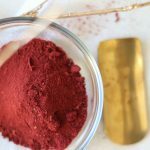 I used 3 medium sized beets and got around 20gms of powder. Thankfully I’m over the beetroot lattes, and don’t need much beetroot powder right now. Im using it to drizzle over my cereal bowl, porridge, yoghurt, and salads. You can adjust the number of beetroots to use as per the quantity you want.This can be easily stored in the fridge for months, so no need to bother even if you make excess of this. Also I would suggest using organic beetroots to make this, for all the reasons organic for is better than the regular veggies. The only ingredient required to make this is beetroots. yep ! thats it. To start, thoroughly wash the beets with enough water, and peel them. Wipe the beets and grate them, using a grater . Pre heat the oven to 180 degrees (Fan). Line your baking pan with parchment paper, and spread the grated beetroot is one layer on the same.Keep in the oven for around 15-18 minutes. 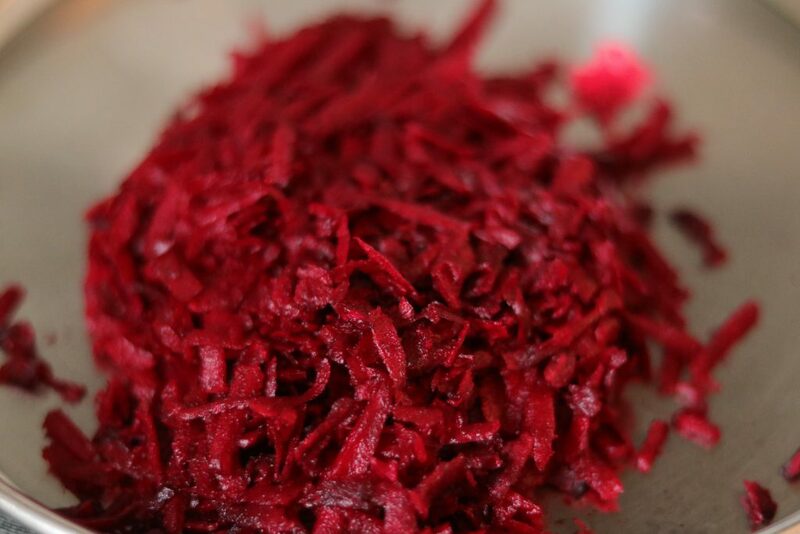 After 8-10 minutes, stir the grated beets to ensure that it is heated uniformly.Once the grated beetroots have dried, and look like the picture below, turn off the oven, open the oven door, and leave it in oven for another 15-20 minutes. 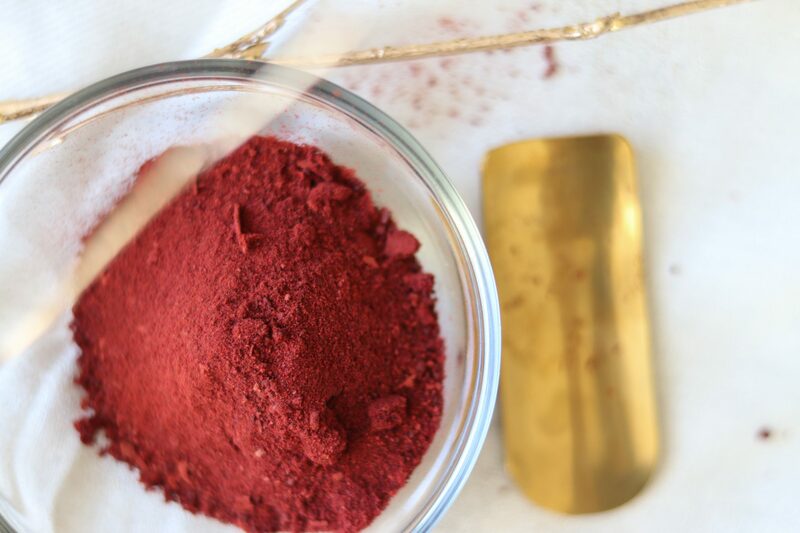 Once cool, grind these in a mixer grinder to form fine powder. Thoroughly wash the beets with enough water. Peel ,wipe the beets and grate the beetroots, using a grater . Pre heat the oven to 180 degrees (Fan). Line your baking pan with parchment paper, and spread the grated beetroot in one layer . Roast in the oven for around 15-18 minutes. 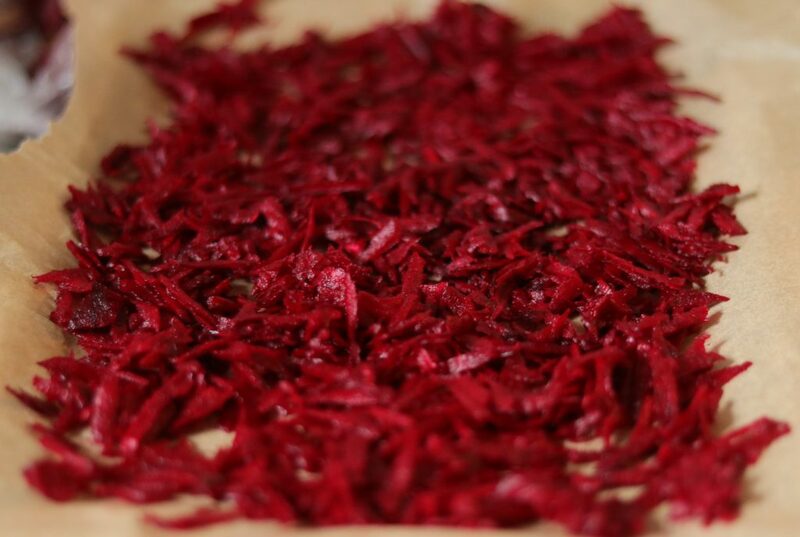 After 8-10 minutes, stir the grated beets to ensure that it is heated uniformly. 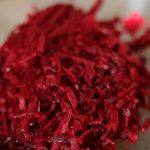 Once the grated beetroots have dried, turn off the oven, open the oven door, and leave the beets in oven for another 15-20 minutes. Once cool, grind these in a mixer grinder to form fine powder. 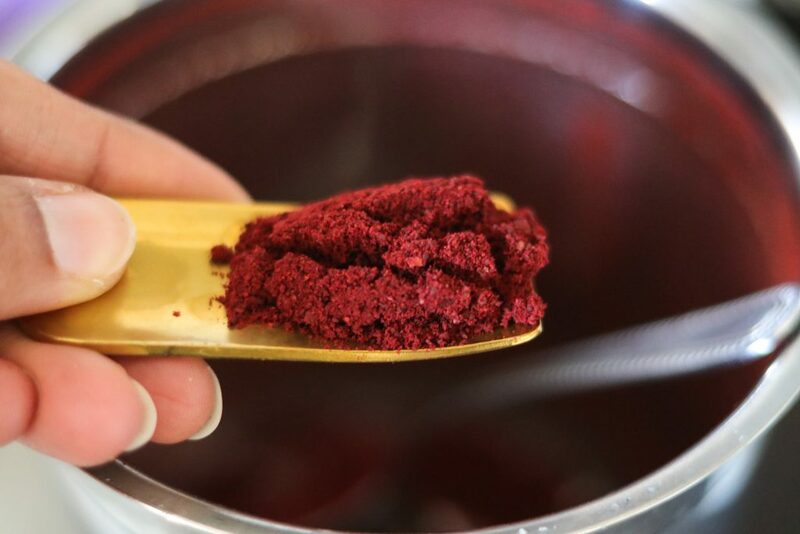 Your beetroot powder is ready. Store in an airtight container, and keep in the fridge ! 2. Make sure not to overheat the beetroots, so check these inbetween cooking and do give them a stir once after 8-10 minutes. 3. If the beetroots qty is high, make sure to increase the cooking time in the oven as per the qty, and spread the qty in a single layer in two different trays. 4. Let the cooked beetroots cool in the oven before grinding. 5. 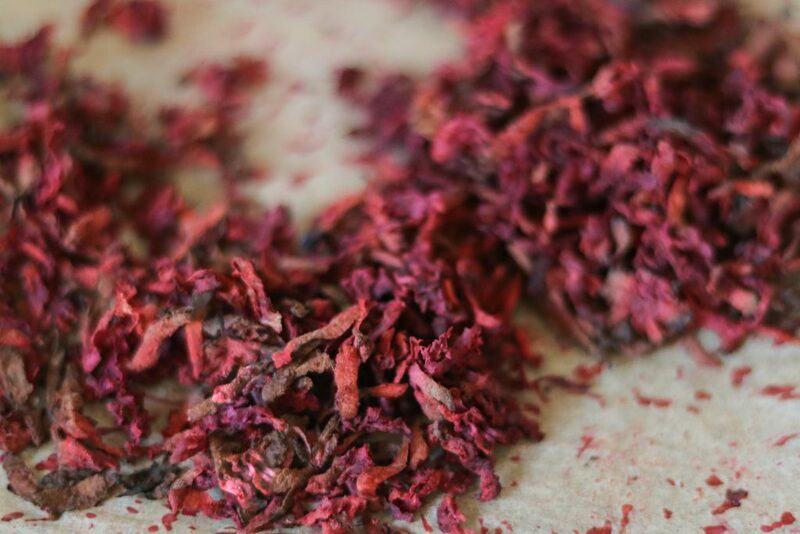 You can use a coffee grinder for grinding the beetroots. 6. Three medium sized beetroots yielded about 20gms of beetroot powder, you can adjust the qty of beetroots to be used as per this.